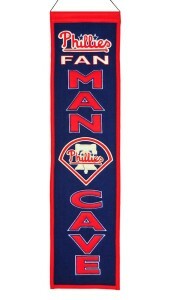 These uniquely shaped banners are the ultimate Man Cave Collectible! Our Man Cave Banner designs feature the teams logo and many include their word mark. Each banner is constructed with appliqu?? and embroidery detail on a heavy wool blend fabric, providing a vintage feel and look. Each banner measures 8" wide x 32" long and includes a hanging cord for easy display.